You know how everyone has some small detail, that few would ever think of, that just so happens to make them nuts? My mother's lies in her name: Charlotte. It's a beautiful name. Full of charm and sophistication and wait, how do you spell that? Is is Sharlot? Charelote? The lucky might guess Charlote. People forget letters, add new ones, and completely rearrange everything else in the process. Then to add insult to injury, her name is never on anything. You know those kiosks full of chatchkas with name's emblazoned on them? Little bitty bicycle license plates. Pencils. Magnets. Bracelets. Bookmarks. Packed full of Johns and Jennifers, Sams and Stephanies, there is just no room for the poor Charlottes. This grave insult means that my mother is a woman on a mission--to find things with her name on them! Whenever I pass one of those kiosks, I always idly check for Charlottes, hoping to nab up any I see. Time and time again, I leave empty handed. So when I was sent to Charlotte, North Carolina for training, I was sent with a purpose. I was to bring back things labeled Charlotte. My father, having been there a few months prior had already made a clean sweep--several keychains, a magnet, a mug, and a t-shirt. So not only was I on a mission; I had to be novel. The gift stores in the airport were uninspiring. Despite looking in every single one, I could not find a single zip up hooded sweatshirt that read Charlotte (that would have been the ultimate trophy). However, I did find a rack of mugs that made me giggle and one made it's way home with me and then off to my mother. 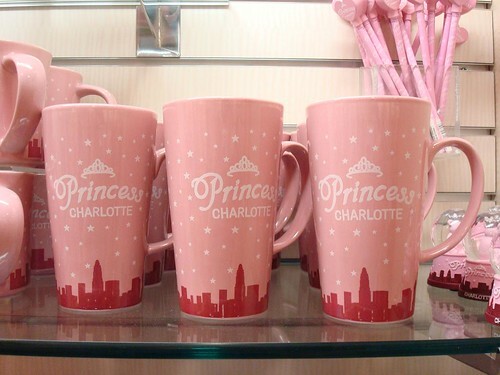 The princess Charlotte mugs were part of a larger Princess Charlotte display. The whole thing was PINK and sparkly and so, so girly. My mother is not "so, so girly". She is (like me) another unpainted, unkempt heathen of fashion. Comfort and practicality reign supreme over the latest colors and bizarre trends. The most involved part of our "daily beauty regimen" is the short time we spend with a blow dryer in one hand and a hair brush in the other. In short, we live in tomboy land. Full of blue jeans and dirt and colors NOT pink. So, naturally, when I saw this mug, I had to buy it. The irony made me. we were just talking about the spelling of names around here too! i remember stalking all those key chain/tooth brush/bike license plate kiosks in hopes to find LEAH...never. it was always LeeAnn or the dreaded LEE! leah seems more popular now and i see it a lot more places but i still get a twinge of excitement when i see it! I can sympathize - Bonny is never there either (although once in awhile you'll find a Bonnie) but that OK.
As far as being fashion-forward, you're miles ahead of me! At least you use a hairdryer and brush - my latest trend is to tug it into a ponytail (still wet) or back with a headband and let 'er dry on its own! I hear ya. Try and find Janine.